The Londoners head across Europe knowing full well that if their win they will be through to the knockout stages of the competition, with two matches remaining in their group. 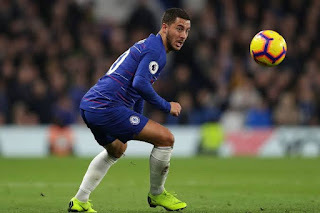 With that in mind, it could be argued that it would have been good to have played Hazard anyway, but he will feature for other reasons rather than that, as the Italian confirmed when he faced the press. ‘According to our doctor there is not any risk, otherwise he would have stayed at Cobham, of course,’ the Chelsea official website quote him as saying. ‘We felt that for him it’s better to play, not for 90 minutes, but to play after two weeks of not playing. Sarri also confirmed that Alvaro Morata has remained back in London to train rather than play another match. The Spaniard caught fire against Crystal Palace at the weekend, but the Chelsea boss is keen for his striker to rest with Olivier Giroud set to face the Belarussians. One man who also will not be involved in the tie is Cesc Fabregas. He was due to play but picked up an injury, which the Blues manager also revealed ahead of the game.